LED and LCD: What’s It All About? 27 Sep LED and LCD: What’s It All About? If you’ve been to this site before you’ll have noticed that a lot of our products use LED and LCD technology. If you want to know more about these technologies, read on. First let’s take a look at LED technology. LED stands for light emitting diode. This technology can be found in many different kinds of devices including digital clocks and watches, televisions and traffic lights. 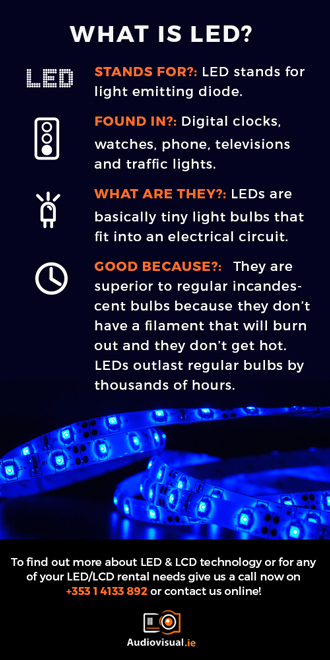 LEDs are basically tiny light bulbs that fit into an electrical circuit. They are superior to regular incandescent bulbs because they don’t have a filament that will burn out and they don’t get hot. LEDs outlast regular bulbs by thousands of hours. Let’s take a closer look at LED technology. A light emitting diode is basically a semi-conductor device that emits light when an electric current is passed through it. The particles that carry the current combine within the semi-conductor, thus producing light. LEDs are described as solid state devices as light is made within the solid semi-conductor material. This solid state lighting is what distinguishes LED technology from other forms of lighting that use heated filaments, such as incandescent and halogen lamps, or gas discharge, such as fluorescent lamps. Different colours are produced in the following way. Within the semi-conductor material, electrons and holes are contained inside energy bands. The separation of the bands determines the energy of the photons that are emitted by the LED. Photons are light particles. The energy of the photon determines the wavelength of the emitted light and hence its colour. Different semi-conductor materials with different band gaps produce different colours. LCD stands for liquid crystal display. This technology is mostly found in laptops and smaller computers. Like LED technology, LCD displays are much thinner than cathode ray tube technology displays. LCDs are also more efficient than LED displays as they work by blocking light rather than emitting it. An LCD is made with either an active or passive matrix display. These terms require a lot of explanation which is beyond this writer’s abilities. Suffice it to say that active matrix displays are superior as the current can be switched on and off more frequently, improving screen refresh time. Basically, LCDs use two sheets of polarizing material with a liquid crystal solution between them. An electric current is passed through the liquid causing the crystals to align so that the light cannot pass through them. Every crystal is like a shutter, either allowing light to pass through or blocking it. There are differences between LED and LCD technology but there are also things they share. The most obvious is that both LED and LCD displays have the advantage of being thin, flat and compact. They can be hung on your wall like a painting. Whether you opt for an LED or LCD display you can be certain that the images generated by them are of the very best quality compared with other displays. We have gone through enough tech talk to justify this claim. All you really need to know is that these technologies are the here for the present and the foreseeable future. Indeed, the chances are you are viewing this article on an LCD or LED screen. Due to their versatility LED and LCD flat screen hire is a firm favourite for making presentations come to life. If you need to hire a flat screen or lighting, you will know, first hand, the power of these LED & LCD technologies. Give us a call now on +353 1 4133 892 or contact us online to find out what we LED & LCD gear we have available to rent!